Christian denominations have variations in their teachings regarding the Holy Spirit. A well-known example is the Filioque controversy, the debates centering on whether the Nicene Creed should state that the Spirit "proceeds from the Father" and then have a stop, as the creed was initially adopted in Greek (and followed thereafter by the Eastern Church), or should say "from the Father and the Son" as was later adopted in Latin and followed by the Western Church, "filioque" being "and the Son" in Latin. The majority of mainstream Protestantism hold similar views on the theology of the Holy Spirit as the Roman Catholic Church, but there are significant differences in belief between Pentecostalism and the rest of Protestantism. The more recent Charismatic movements have a focus on the "gifts of the Spirit", but often differ from Pentecostal movements. Non-trinitarian views about the Holy Spirit differ significantly from mainstream Christian doctrine. 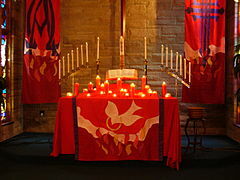 According to Roman Catholic theology the primary work of the Holy Ghost is through the Church. According to the Encyclical of Pope Leo XIII Divinum illud munus: "...the indwelling and miraculous power of the Holy Ghost; and the extent and efficiency of His action, both in the whole body of the Church and in the individual souls of its members, through the glorious abundance of His divine graces. Through the Church's sacraments, Christ communicates His Holy and sanctifying Spirit to the faithful." Around the 6th century, the word Filioque was added to the Nicene Creed, defining as a doctrinal teaching that the Holy Ghost "proceedeth from the Father and the Son". The holy Council of Florence in 1438 proclaims: "The Holy Ghost is eternally from Father and Son; He has his nature and subsistence at once (simul) from the Father and the Son. He proceeds eternally from both as from one principle and through one spiration. . . . And, since the Father has through generation given to the only-begotten Son everything that belongs to the Father, except being Father, the Son has also eternally from the Father, from whom he is eternally born, that the Holy Spirit proceeds from the Son." In the Church, the Western tradition professes the consubstantial communion between the Father and the Son, by saying that the Spirit proceeds in eternity from the Father and the Son (filioque). It says this, "legitimately and with good reason", for the eternal order of the divine persons in their consubstantial communion implies that the Father, as "the principle without principle", is the first origin of the Spirit, but also that as Father of the only Son, he is, with the Son, the single principle from which the Holy Spirit proceeds." Since the Council of Florence, greater theological discussion between the Roman Catholic Church and Eastern Orthodox Church, has developed a greater sense of agreement on the matter. Both the East and West have agreed that the same essential meaning can be expressed in the belief that the Spirit proceeds from the Father and the Son and from the Father through the Son. Although certain disagreements do continue beyond the Filioque clause on the matters of God's nature, the co-equality of the Trinity, the Eastern belief in a "Monarchy of the Father", and relational Subordinationism. While the Eastern Catholic churches are required to believe the doctrinal teaching contained in the Filioque, they are not all required to insert it in the Creed when it is recited during the Divine Liturgy, so as to use the liturgical text as it was in antiquity. Eastern Orthodoxy proclaims that the Father is the eternal source of the Godhead, from whom the Son is begotten eternally, and also from whom the Holy Spirit proceeds eternally. Unlike the Roman Catholic Church and Western Christianity in general, the Orthodox Church does not espouse the use of the Filioque ("and the Son") in describing the procession of the Holy Spirit. Filioque was mentioned for the first time at the Third Council of Toledo in 589 and it was added by the Roman Catholic Church to the Credo in the 11th century. The Holy Spirit is believed to eternally proceed from the Father, as Christ says in John 15:26, and not from the Father and the Son, as the Roman Catholic and Protestant churches claim. The Greek Orthodox Church teaches that the Holy Spirit proceeds through the Son, but only from the Father. Orthodox doctrine regarding the Holy Trinity is summarized in the Symbol of Faith (Nicene-Constantinopolitan Creed). Oriental Orthodox usage coincides with Eastern Orthodox usage and teachings on the matter. The Assyrian Church of the East also retains the original formula of the Creed without the Filioque. The majority of mainstream Protestantism hold similar views on the theology of the Holy Spirit as the Roman Catholic Church, as described above. There are significant differences in belief between Pentecostalism and the rest of Protestantism. During the late 19th century, the prevailing view in the Restoration Movement was that the Holy Spirit currently acts only through the influence of inspired scripture. This rationalist view was associated with Alexander Campbell, who was "greatly affected by what he viewed as the excesses of the emotional camp meetings and revivals of his day." He believed that the Spirit draws people towards salvation, but understood the Spirit to do this "in the same way any person moves another—by persuasion with words and ideas." This view came to prevail over that of Barton W. Stone, who believed the Spirit had a more direct role in the life of the Christian. Since the mid-late 20th century, many among the Churches of Christ have moved away from this "word-only" theory of the operation of the Holy Spirit. As one student of the movement puts it, "[f]or better or worse, those who champion the so-called word-only theory no longer have a hold on the minds of the constituency of Churches of Christ. Though relatively few have adopted outright charismatic and third wave views and remained in the body, apparently the spiritual waves have begun to erode that rational rock." The Holy Spirit descending at Pentecost by Anthony van Dyck, circa 1618. While the Holy Spirit is acknowledged as God in all mainstream denominations, he is given particular emphasis in Pentecostal churches. In those churches he is seen as the giver of natural and supernatural gifts, such as tongues and prophecy, to modern-day Christians. The Christian movement called Pentecostalism derives its name from the event of Pentecost, the coming of the Holy Spirit when Jesus' disciples were gathered in Jerusalem. [Acts 2] Pentecostals believe that when a believer is "baptized in the Holy Spirit", the gifts of the Spirit (also called the charismata) are activated in the recipient to edify the body of Christ, the church. Some of these gifts are listed in 1 Corinthians 12. The Pentecostal movement places special emphasis on the work of the Holy Spirit, and especially on the gifts mentioned above, believing that they are still given today. Much of Pentecostalism differentiates the "baptism with the Holy Spirit" from the salvific born again experience, considering it a usually distinct experience in which the Spirit's power is received by the Christian in a new way, with the belief that the Christian can be more readily used to perform signs, miracles, and wonders for the sake of evangelism or for ministry within the church (the body of Christ) and the community. There are also some Pentecostals who believe that Spirit baptism is a necessary element in salvation, not a "second blessing". These Pentecostals believe that in the baptism in the Holy Spirit, the power of the Spirit is released in their lives. Many Pentecostals believe that the normative initial evidence of this infilling (baptism) of the Holy Spirit is the ability to speak in other tongues (glossolalia), and that tongues are one of several spiritual manifestations of the presence of the Holy Spirit in an individual believer's life. Non-trinitarian views about the Holy Spirit differ significantly from mainstream Christian doctrine and generally fall into several distinct categories. Groups with Unitarian theology such as Polish Socinians, the 18th-19th Century Unitarian Church, and Christadelphians conceive of the Holy Spirit not as a person but an aspect of God's power. Christadelphians believe that the phrase Holy Spirit refers to God's power, mind or character depending on the context. Though Arius believed that the Holy Spirit is a person or high angel, that had a beginning, modern Semi-Arian groups such as Dawn Bible Students and Jehovah's Witnesses believe that the Holy Spirit is not an actual person but is God's "power in action", "breath" or "divine energy", which had no beginning, that he uses to accomplish his will. Jehovah's Witnesses do not typically capitalize the term, and define the Holy Spirit as "God's active force". Armstrongites, such as the Living Church of God, believe that the Logos and God the Father are co-equal and co-eternal, but they do not believe that the Holy Spirit is an actual person, like the Father and the Son. They believe the Holy Spirit is the Power, Mind, or Character of God, depending on the context. They teach, "The Holy Spirit is the very essence, the mind, life and power of God. It is not a Being. The Spirit is inherent in the Father and the Son, and emanates from Them throughout the entire universe". Mainstream Christians characterise this teaching as the heresy of Binitarianism, the teaching that God is a "Duality", the Father and the Word, or "two-in-one", rather than three. Oneness Pentecostalism, as with other modalist groups, teach that the Holy Spirit is a mode of God, rather than a distinct or separate person from the Father. They instead teach that the Holy Spirit is just another name for the Father. According to Oneness theology, the Holy Spirit essentially is the Father. The United Pentecostal Church teaches that there is no personal distinction between God the Father, the Son, and the Holy Spirit. These two titles "Father" and "Holy Spirit" (as well as others) do not reflect separate "persons" within the Godhead, but rather two different ways in which the one God reveals himself to his creatures. Thus, the Old Testament speaks of "The Lord God and his Spirit" in Isaiah 48:16, but this does not indicate two "persons" according to Oneness theology. Rather, "The Lord" indicates God in all of His glory and transcendence, while the words "His Spirit" refer to God's own Spirit that moved upon and spoke to the prophet. The Oneness view is that this does not imply two "persons" any more than the numerous scriptural references to a man and his spirit or soul (such as in Luke 12:19) imply two "persons" existing within one body. In the Latter Day Saint movement, the Holy Ghost (usually synonymous with Holy Spirit) is considered the third distinct member of the Godhead (Father, Son and Holy Ghost), and to have a body of "spirit," which makes him unlike the Father and the Son who are said to have bodies "as tangible as man's." According to LDS doctrine, the Holy Spirit is believed to be a person, however having a body of spirit, he is able to pervade all worlds. Mormons believe that the Holy Spirit is part of the "Divine Council" or "Godhead", but that the Father is greater than both the Son and the Holy Spirit. However, a number of Latter Day Saint sects, most notably the Community of Christ (second largest Latter Day Saint denomination) and the Church of Christ (Temple Lot), and those sects separating from the Community of Christ and Church of Christ, follow a traditional Protestant trinitarian theology. The Unity Church interprets the religious terms Father, Son, and Holy Spirit metaphysically, as three aspects of mind action: mind, idea, and expression. They believe this is the process through which all manifestation takes place. As a movement that developed out of Christianity, Rastafari has its own unique interpretation of both the Holy Trinity and the Holy Spirit. Although there are several slight variations, they generally state that it is Haile Selassie who embodies both God the Father and God the Son, while the Holy (or rather, "Hola") Spirit is to be found within Rasta believers (see 'I and I'), and within every human being. Rastas also say that the true church is the human body, and that it is this church (or "structure") that contains the Holy Spirit. ^ a b Millard J. Erickson (1992). Introducing Christian Doctrine. Baker Book House. p. 103. ^ a b David Watson (1973). One in the Spirit. Hodder and Stoughton. pp. 39–64. ^ The Unitarian: a monthly magazine of liberal Christianity ed. Jabez Thomas Sunderland, Brooke Herford, Frederick B. Mott - 1893 "We believe in the Holy Spirit, man's sole reliance for guidance, safety, or salvation, not as a separate person, entity, reality, or consciousness, existent apart from man or God, but as the recognizing sympathetic inter-communication in love between God and the human soul, the direct converse or communion of man's consciousness with Deity." ^ Broughton, James H.; Peter J Southgate. The Trinity: True or False?. UK: The Dawn Book Supply. Archived from the original on 2011-11-18. ^ "Is the Holy Spirit a Person?". Awake! : 14–15. July 2006. ^ Peter Althouse Spirit of the last days: Pentecostal eschatology in conversation p12 2003 "The Oneness Pentecostal stream follows in the steps of the Reformed stream, but has a modalistic view of the Godhead"
^ See under "The Lord God and His Spirit," in Chapter 7 of David Bernard, The Oneness of God Archived 2008-02-16 at the Wayback Machine. ^ Wilson, Jerry A. (1992). "Holy Spirit". In Ludlow, Daniel H (ed.). Encyclopedia of Mormonism. New York: Macmillan Publishing. p. 651. ISBN 0-02-879602-0. OCLC 24502140. "The Holy Spirit is a term often used to refer to the Holy Ghost. In such cases the Holy Spirit is a personage." ^ McConkie, Joseph Fielding (1992). "Holy Ghost". In Ludlow, Daniel H (ed.). Encyclopedia of Mormonism. New York: Macmillan Publishing. pp. 649–651. ISBN 0-02-879602-0. OCLC 24502140. ^ Doctrine and Covenants 131:7–8: "There is no such thing as immaterial matter. All spirit is matter, but it is more fine or pure, and can only be discerned by purer eyes; We cannot see it; but when our bodies are purified we shall see that it is all matter." ^ "Guide to the Scriptures: Holy Ghost". www.lds.org. Retrieved 2017-07-17. ^ a b Millennial Star. XII. October 15, 1850. pp. 305–309. Retrieved 2012-12-17. ^ "Basic Beliefs Articles of Faith and Practice". Church of Christ. Retrieved 21 January 2015.